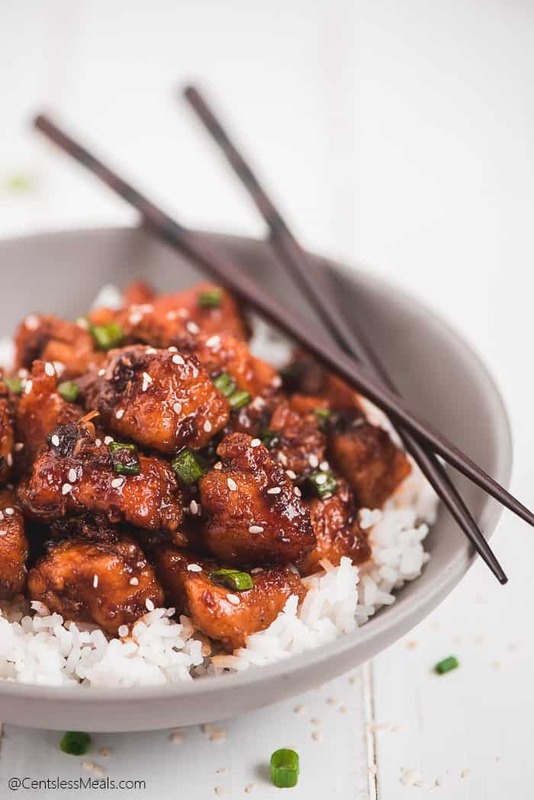 This Instant Pot Honey Garlic Chicken is a sweet and spicy Asian chicken dish that tastes just like take-out and requires less than 20 minutes to throw together. 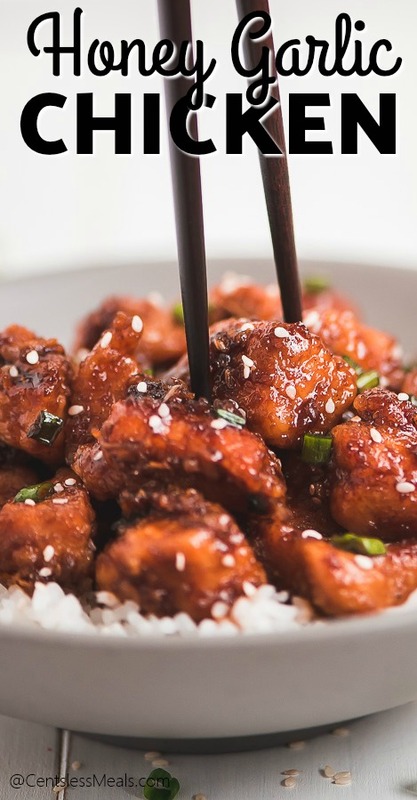 Like everyone, I love a good ole dinner of Chinese take-out. But why pay more and wait longer for chicken and rice when you can make it yourself? 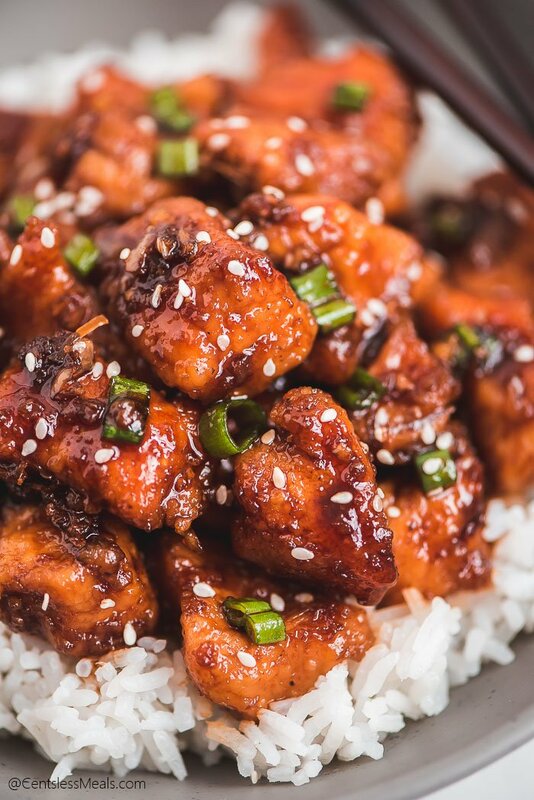 This Honey Garlic Chicken comes together in just 20 minutes and has the classic texture and taste of your favorite Chinese restaurant but without all the grease. Winning! Since this comes together so quickly, you’ll want to prep the sauce first. 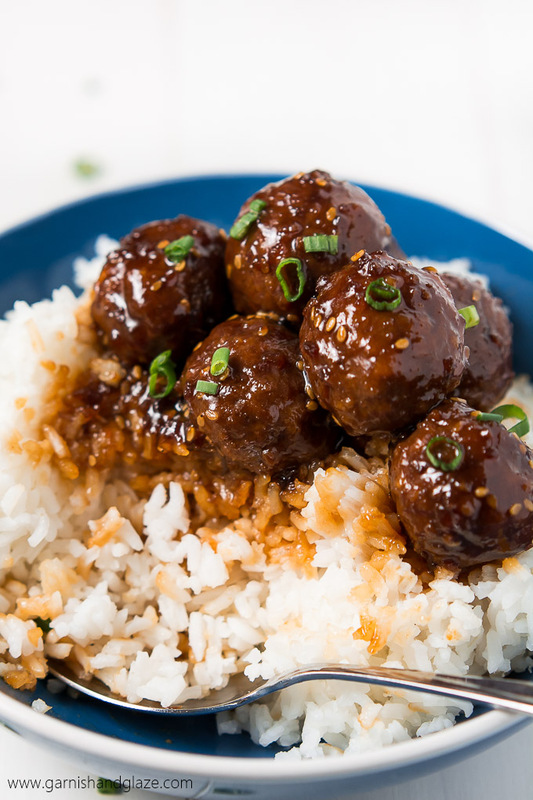 The sauce is made up of honey, soy sauce, minced garlic, and for some heat – sriracha sauce. All you have to do is mix it together. Next, you’ll season the chicken and toss it in some cornstarch and then brown it on all sides. This can be done two ways – in the Instant Pot on “saute” or in a skillet. When browning any meat, avoiding stirring or moving the meat. After adding the chicken to the pot, let it cook 2-3 minutes to form a nice crust, flip, and cook another 2-3 minutes. 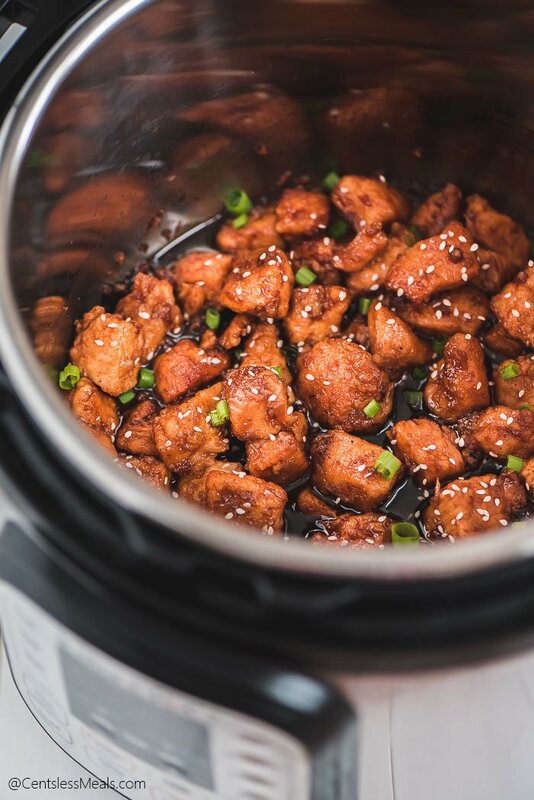 If using the Instant Pot, it’s important to deglaze the bottom of the pot after browning or else the little bits will burn and the pressure cooker will shut off. To deglaze the pan, you’ll add 1/4 cup water and scrape the bottom with a wooden spoon until all the bits come loose. Add the chicken back to the pot along with the sauce, close the pressure cooker, and set the knob to “seal”. Cook at high pressure to 2 minutes followed by a quick release. I like to cover the knob with a towel so that the steam and water doesn’t get everywhere, especially on me. Once it’s done, remove the lid, add the green onions and sesame seeds and serve over rice. Easy peasy! 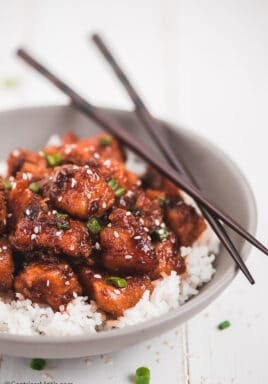 Can I make this if I don’t have an Instant Pot? 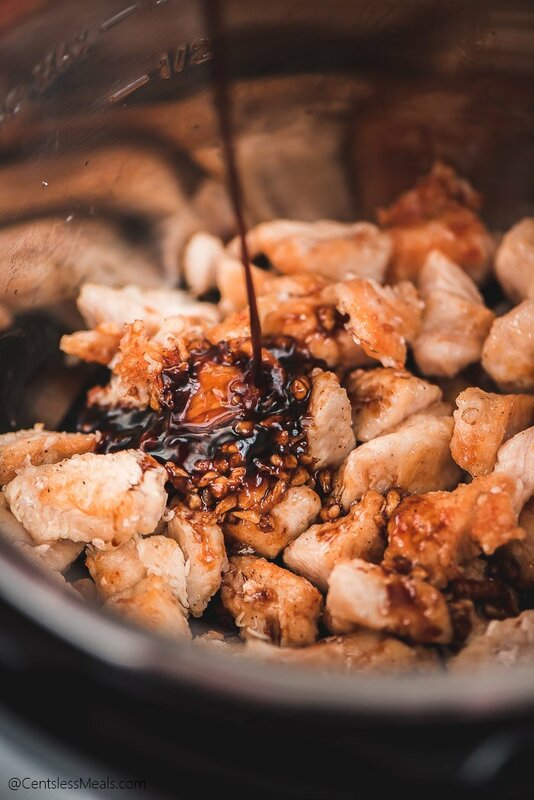 Slow Cooker Method: You’ll lightly brown the chicken (it should NOT be cooked all the way through) in a skillet and then transfer it to the bottom of a slow cooker along with the sauce. Then you’ll cook it on low for 2 hours. Stovetop Method: This requires an extra pot to cook and thicken the sauce. You’ll place all the sauce ingredients in a small pot and bring to a simmer. Whisk 1 tablespoon cornstarch mixed with 1 tablespoon water and cook until thickened. Brown the chicken in a skillet on all sides, cooking until the chicken is cooked throughout. 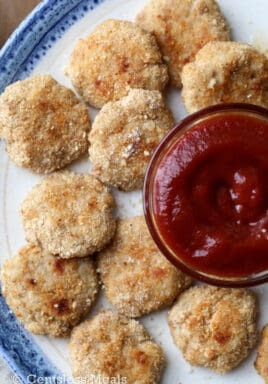 Add the sauce and mix until coated and you’re ready to serve. 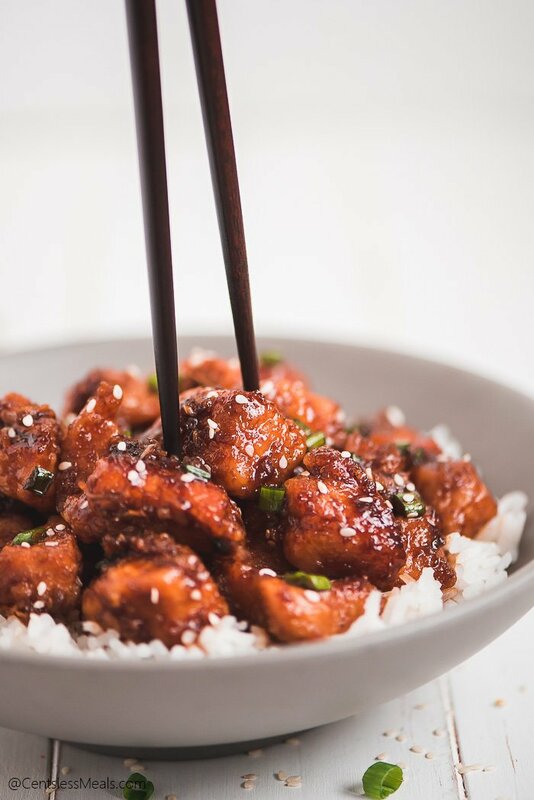 If you like dishes like Orange Chicken and Beef & Broccoli, no matter what method you choose make this Honey Garlic Chicken, I’m sure you’ll love it! 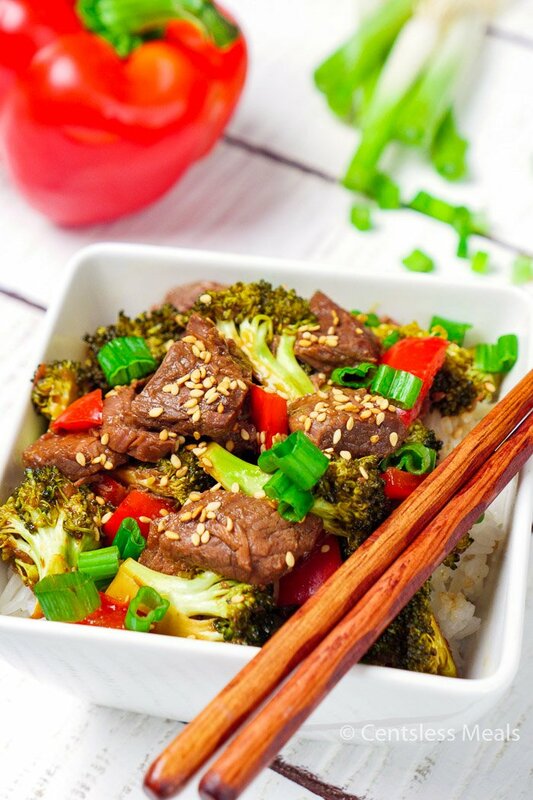 Serve over rice and with a side of steamed veggies and you’ve got a complete meal that the family will be begging you to make again and again. If bits have stuck to the bottom of the Instant Pot, pour in 1/4 cup water and deglaze the bottom of the pan by scraping it with a wooden spoon. Keep scraping the bottom of the pan while the heat is on until almost all the water has evaporated. Turn off the saute function. Add the chicken back to the bottom of the Instant Pot and pour the honey sauce on top. Cover with lid, set knob to seal, and cook on high pressure for 2 minutes followed by a quick release. Remove lid when safe to open. 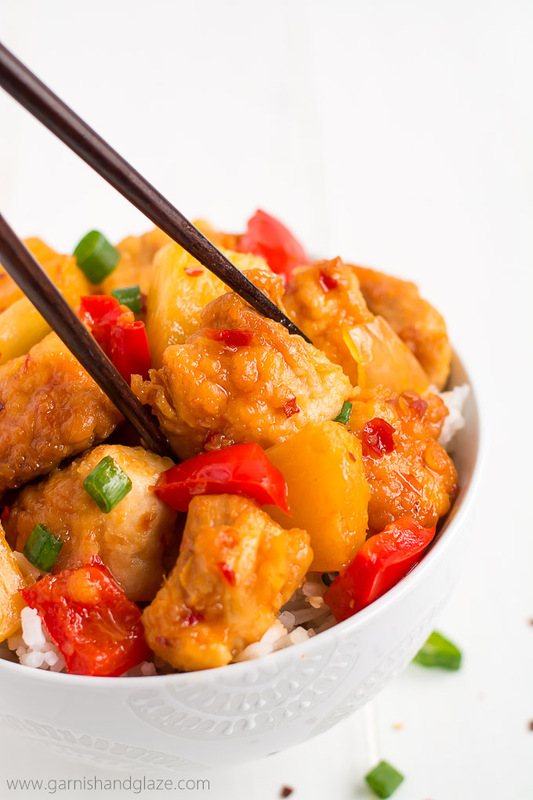 Place the chicken and sauce in in the slow cooker and cook on low for 2-3 hours. If you want to add veggies like peppers you can throw them in halfway through. I’ve made this twice now. It’s super simple and it tastes good, but I have a problem with the sauce not being very thick. I have to sauté again after pressure cooking. Any suggestions? You could try adding a cornstarch slurry to thicken it Erika. 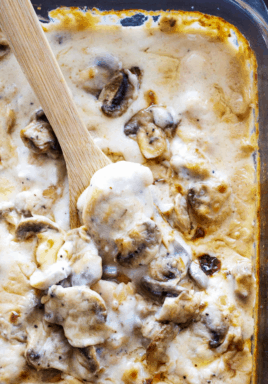 So glad you love this recipe! 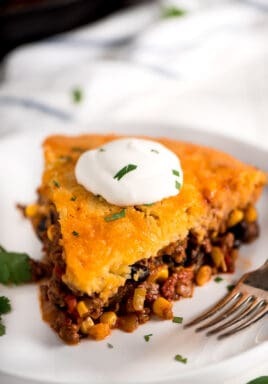 I made this recipe for the first time tonight and it was fantastic! Definitely a keeper and I’ll be making it again soon! Happy to hear how much you love the chicken Lisa! This recipe has a calorie count, but no information about serving size. It also reads as though you’re supposed to leave the 1/4 cup water in the instant pot after deglazing, but it’s not clear. The recipe makes 4 servings. Correct, you leave the water, scraping the bottom of the pan while the heat is on until almost all the water has evaporated.